The actor group Surprise (Seo Kang-joon, Yoo Il, Gong Myung, Kang Tae-oh, Lee Tae-hwan) are becoming global actors. Surprise was invited to the 2015 DramaFever Awards held at the Hudson Theater, New York on the 5th. 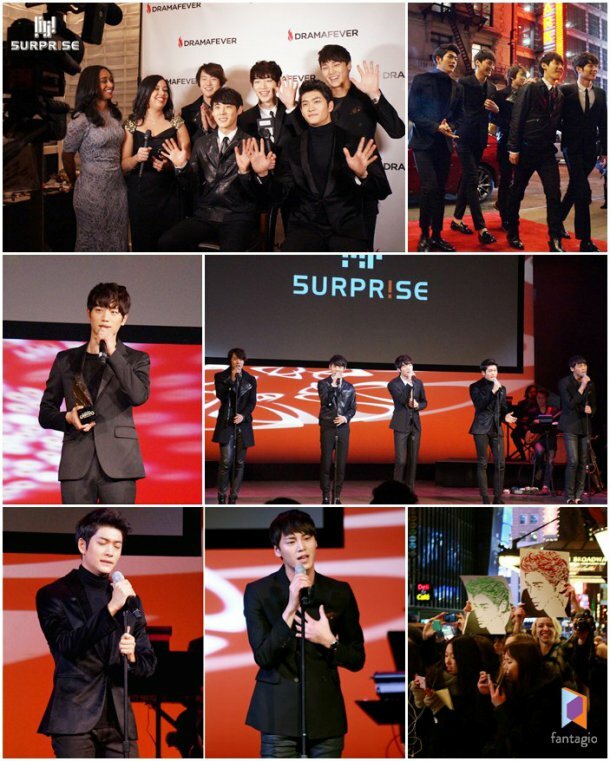 Seo Kang-joon and fellow members did their first ever performance in New York. They sang the songs, "Hey You, Come on", an OST from their debuting drama-toon "See You After School - Drama" and "From My Heart", the first title song of their single. "See You After School - Drama" has already been broadcasted in the US and fans were familiar with it. Prior to the wedding, a huge number of fans and press gathered at the red carpet outside the theater despite the weather being minus 16 degrees celsius. Blonde women stood outside the red carpet holding a caricature saying, "Kang-joon! Surprise! I love you~". 80% of the people at DramaFever are non-Asians who use English as their first language so the fact that Surprise were invited there is a great statement. Seo Kang-joon received an award for Best Bromance with Joo Sang-wook from the MBC drama "Sly and Single Again". In his speech, he said, "This is a great honor and I think this was only possible thanks to Joo Sang-wook. I'm afraid he's not here right now but I want to share this with him". The other members cheered for him. After their second performance "From My Heart", they promised wistful fans that they'll be back and went off stage. Surprise said, "We haven't performed in many countries yet but we can't believe we just did at a stage in Broadway, New York, the heart of performance and culture. We are amazed the fans even recognize us and we want to come back just for shows later in the future when we're ready and that much better". This is the 3rd DramaFever Awards so far and it's hosted by a drama streaming site called DramaFever which has up to 22 million users based in the North and South Americas. There are 12 categories for awards and they winners are nominated personally by the users. About 1.5 million users participated in this year's decisions. Meanwhile, Surprise is an actor group which debuted in 2013 with the drama-toon "See You After School - Drama" and actors like Seo Kang-joon and Lee Tae-hwan who starred in dramas "Sly and Single Again", "This Is Family", "Roommate" and "The King of High School Manners" and "Pride and Prejudice". Gong Myung has been cast for the drama "Splendid Politics", Yoo Il is lead starring in a musical and Kang Tae-oh in "The Queen's Flower". Surprise is releasing their first single "From My Heart" this February and are planning a tour to 6 different Asian counties including Thailand which they've been to before. "'Surprise' Seo Kang-joon and others at 3rd Annual DramaFever Awards in US"